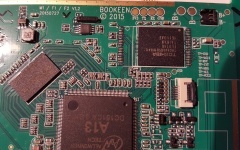 Bookeen is French company dealing with e-books and consumer electronics. The Muse is their main 6 inches eReader, with different version. The case is the same, but the screen resolution and the inside memory are different. You can look at the back of the device to know its reference. This is for the eMMC, 800x600 device. Not supported by Linux mainline. But Bookeen has a Github repo with some sources. U-Boot 2011 source code is released here. Not supported yet, there is no device tree file available. Source code for kernel 3.0 is released here. It is very similar to the allwinner source released a few years ago. Not supported. No device tree available. There are multiple devices using this form factor. You should read the serial on the back. You can enter FEL mode with special SD card. 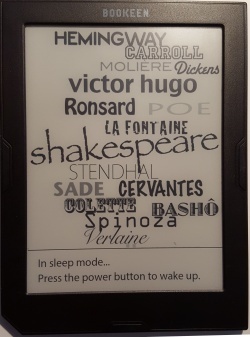 The device uses an e-ink display driven by TPS65185 PMIC chip (same PMIC seems to be used on Kobo and Nook eReaders). The driver seems to be software only, and is available in the kernel source code. The motherboard has 4 pins labelled 3V3/TX/RX/GND. Connecting them allows to see the boot process, and to get access to a busybox shell. Login is root, with no password. No screws, only remove the back side. This page was last modified on 13 February 2017, at 13:12.